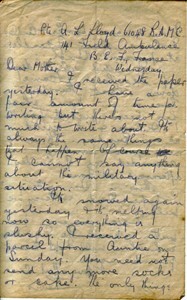 Letter from Lewis Lloyd to his Mother dated Wednesday. He says he has time for writing but there is not much to write about as he cannot talk about the military situation. He talks about the snow. He asks them to not send any more socks or cake but to send candles and books. He mentions he went up to the line for 8 days and came down on Thursday. 1 page. 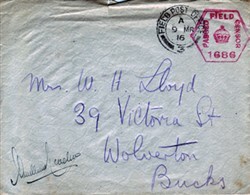 There is also the original envelope stamped ‘FIELD POST OFFICE 3 A 9 MR 16’ and ‘PASSED FIELD CENSOR 1686’.